No pressure Mr. Wright, but Shigeru Miyamoto is here to watch the movie. Want permission to use Nintendo music in your movie? Well, you better hope that Shigeru Miyamoto likes it. 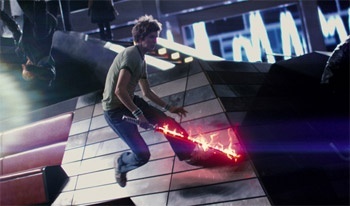 In order to use music from Legend of Zelda in one of Scott Pilgrim vs. The World's dream sequences, director Edgar Wright had to show the film to the Mario creator. Wright was able to use the music, which suggests that Miyamoto gave it the thumbs up. Wright said that he tried to stress the importance that games like Zelda have to people when he when he contacted Nintendo: "When I was writing to Nintendo to get permission, I was saying, 'This music is like nursery rhymes to a generation.'" I was already planning on seeing this movie, so for me this is a just the icing on the cake. A director that gets videogames at the helm of a movie that looks interesting and fun? Sign me up! Scott Pilgrim vs. The World opens on August 13th.